National chairman of the All Progressives Congress (APC), Adams Oshiomhole has refused why the party refused to submit Governor Rochas Okorocha’s son-in-law as the party’s governorship candidate. According to Oshiomhole, the party submitted the name of Hope Uzondima, senator representing Imo west, to the Independent National Electoral Commission (INEC) as its governorship candidate in Imo. The former Edo state governor said this was to done in a bid, to continually uphold the truth in the interest of the party and its members in Imo. 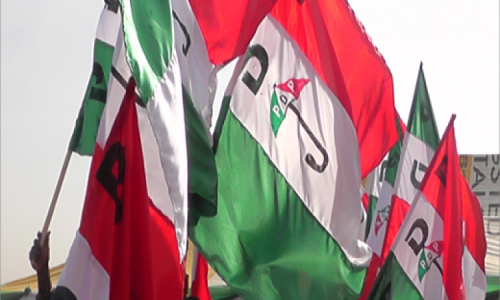 The former labour leader said while speaking with newsmen at the headquarters of the party in Abuja. Oshiomhole said Governor Okorocha, was trying to use the “party instruments to build a political dynasty”, which he wouldn’t allow. “What I am not able to do for governor Okorocha is to assist him with the instrument of the APC to help him to build a political dynasty. “We have prepared the name of senator Hope Uzodinma and submitted it to the INEC. If Governor Rochas chose to relocate to the Villa and use the grounds of villa to try to intimidate me to create a dynasty, I won’t accept it.